We talked with Austin Poynter last February 9th, 2011, just after he won the Vans Protec Amateur Combi Pool Party. At the time, he was blasting high, big airs in the combi and I though Austin was competing with Lizzie to be Allysha's best skater pal, but it seems Lizzie is finally winning by a big margin. LOL! Actually, Allysha and Austin were with Termite together when they were 9 and 10 years old, so they have know each other for a very long time now, but girls tend to stick together, you know the BFF stuff ... LOL!! Well, Since the three of them won the Combi Pool Party contest at the Block, they are now in the same league. In case you were not in planet skateboarding for the past days, Allysha won the girl's Vans Pool two days ago... Duh... And if you did not know, you have to read the Combi Report. It's not that the three of them were not in the same league in the fisrt place: Allysha, Lizzie and Austin are the whizz kids of Southern California skateboarding (so, we are talking about universality, right?) and they make their elders stare at them with jaw dropping expressions. isTia.Tv: It’s been 9 months since we have done the last interview, what have you done during this time? Austin Poynter: Had a great summer, skated a lot, now I’m back in school for my junior year and it’s going pretty well. 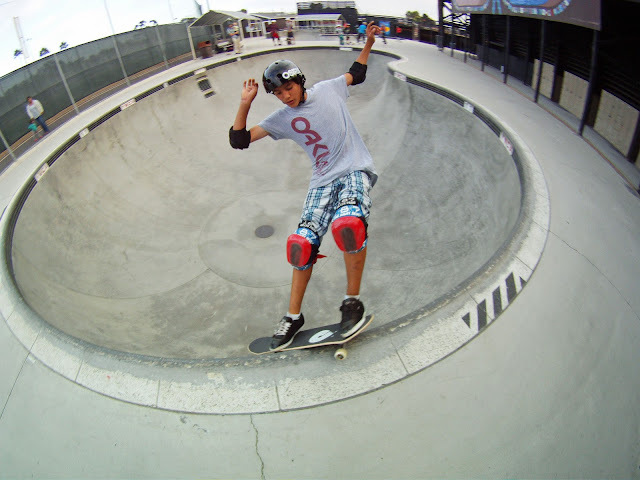 isTia.Tv: Tell me about the shred for Autism event, I have heard that you were the featured skater at the YMCA Encinitas for that. What was the event about and how were you chosen for the event? Austin Poynter: The event was for the families that have been affected by autism. The families were able to watch some skating, take a tour through the park, and all the kids got free skateboards and helmets. The YMCA asked me if I would go and skate, I was honored to be there and meet some of the families. isTia.Tv: Where do you skate more often? Austin Poynter: I’ve mostly been skating the Encinitas YMCA and lately I’ve been going up to Tony Hawk’s ramp for a session and Vans on the weekends. isTia.Tv: Do you have a backyard pool? Austin Poynter: No, I wish! Maybe someday though… hahaha. isTia.Tv: Who are your sponsors? 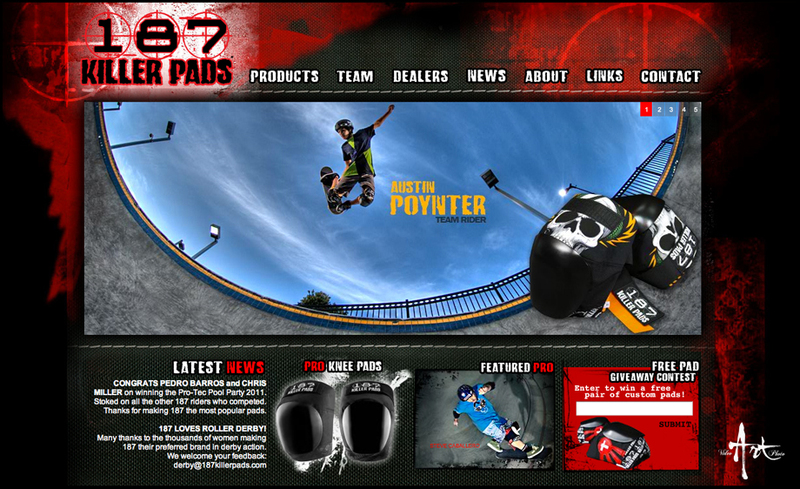 Austin Poynter: Oakley, Powell-Peralta, Osiris Shoes, GoPro, Bones, S-One Helmets, 187 Pads, McGills Skate shop. 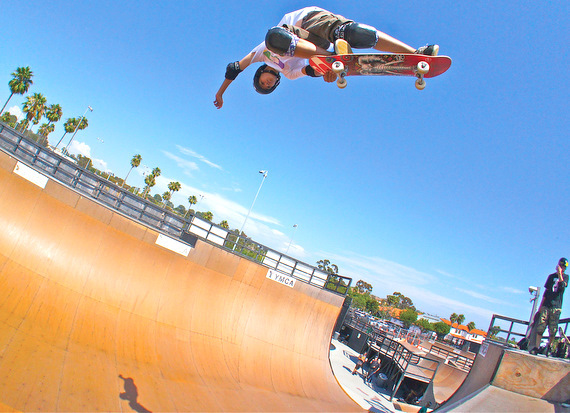 Austin Poynter filming at Vans skatepark with Kyle Ohlson. This air was measured at 9 feet 7 1/2 inches high and he wasn't going for height. isTia.Tv: Do you have new sponsors? Austin Poynter: Yeah, just got picked up by GoPro, so stoked, their Camera’s are awesome! isTia.Tv: How did you get sponsored by GoPro? How did they contact you? What’s the deal? Do you make a lot of pics/vids with this? Austin Poynter: I got referred by The Grind For Life Guys, so cool of them to put in the good word for me! I have a few videos I made and I’ve been filming with my friend Kyle lately so I should have something new out soon. isTia.Tv: What do you do with your GoPro camera? Austin Poynter: I actually just finished up a DIY monopod that I’ve been filming with lately, and besides that, I have a helmet specifically for filming. isTia.Tv: You're so good, If we knew what equipment you use, maybe we would have a chance? Can you spare a little wisdom on us? Austin Poynter: Well I use three different set ups. For vert, I just moved up a size from an 8 to an 8.18 and I’ve been loving it, but for everything else I’m still riding an 8. For the most part, everything is standard except the custom 187 pads I get. I use Bones Wheels sizes 54, 56, and 60’s. Bones Bearings and Indy Trucks. isTia.Tv: Describe what is a kickflip mute and when did you learn it? Why the heck did you learn to do this? To impress girls? 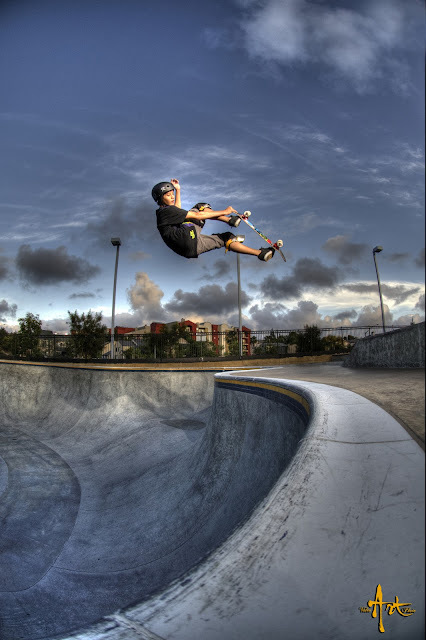 Austin Poynter: It’s like a kickflip indy but instead of grabbing with your front hand, you grab with the back. I learned it because I always loved the way the trick looked.. And, no... (impress girls...) wasn’t the first thing on my mind to learn it but I’m sure it’s a plus, hahaha. ﻿ isTia.Tv: Is there a trick you landed once and have never been able to reproduce? Austin Poynter: I’ve done blunt to fakie on the vert ramp once, but I’ve never been able to do it again. isTia.Tv: You're flying so high over the coping, to the friendly skies. Do you want to work for an airline company? 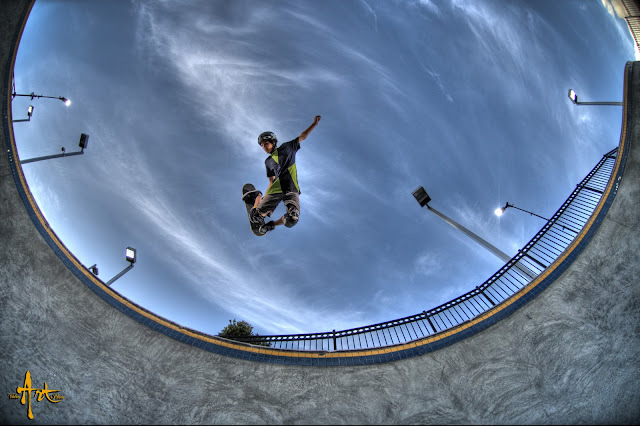 Are you sometimes afraid when you are flying high above the coping that you may break your neck on the coping? Austin Poynter: Haha, no, never thought of it until now. isTia.Tv: What is more dangerous, street skating or bowl/vert riding? Austin Poynter: I think bowl skating is the most physically demanding, but I’ve never gave too much time street skating. isTia.Tv: Do you try to limit your number of friends on facebook? Austin Poynter: I kinda just accept anyone that sends in a request. isTia.Tv: Do you envision skating without Morgan and Allysha? Does skating without them make your life miserable? Austin Poynter: I don’t get to skate with them that often but when I get the chance, it’s always a fun session. isTia.Tv: What's the difference between the old Vans Combi and the new Vans combi? 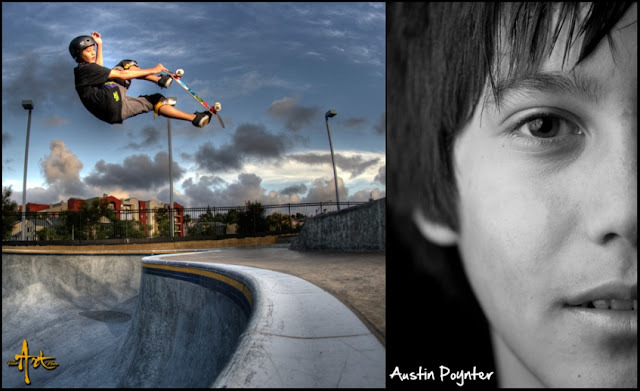 Austin Poynter: I first learned how to skate bowl in the old Vans Combi so I didn’t really know anything different. After they redid it, it opened so many new lines and it felt way better to skate. isTia.Tv: What music would you listen to if red Hot Chili Peppers did not exist? Austin Poynter: I’ve been getting into Nirvana recently, they’re pretty good too. isTia.Tv: Who are you top music artists/groups/bands? Austin Poynter: Red Hot Chili Peppers, Nirvana, Black Sabbath, Led Zeppelin…. a lot of older stuff. isTia.Tv: I’ve heard you are pretty good at school, how good are you? Austin Poynter: I guess I’m alright, haha. I think I have a 3.5 right now. I prefer math, it’s pretty straight forward… it’s either right or wrong. But when I read, I go more for the adventure\comedy books. isTia.Tv: What is that award you are going to receive? Austin Poynter: It was a Letterman’s jacket that I just got the other day. Austin Poynter. Tweaked out backside nosegrab at the YMCA vert Ramp. isTia.Tv: What’s the The Girard PREP that you just received? Austin Poynter: It’s a program the helps students into getting into a four year college. isTia.Tv: How are your parents supportive? Austin Poynter: My parents moved our family down to San Diego just for the vert ramp (at least that’s what they want me to believe… I think they just like the area hahaha) and pay for every trip to the skatepark whether it’s as far as Vans or to the YMCA. isTia.Tv: What future contests do you have in mind winning? All of them? Austin Poynter: I’m generally not to worried about winning a contest… as long as I’m having fun doing them, that’s good enough for me. Thanks to Art Video Photo ( Guto Lamera)and Gerry Poynter for the amazing shots. Muito obrigado. Você está fazendo um trabalho impressionante! All pictures published by permission only.